Home / Retirement Planning / How Do I Choose My Investments? Some people may not participate in their retirement plan because they don't have the knowledge they need to feel comfortable making investment decisions. By taking a moment to review the investment education provided below, you may gain an understanding of investment fundamentals such as asset classes and investment risks, asset categories and other investment types. Bonds2—Investments in which you are lending money to the bond issuer to be repaid on a certain date with interest. Stocks or Equities—Investments in which you become part owner of the company and share in its profits and losses. Beware of Inflation—Just as you should be aware of investing too aggressively, you should also be aware of being too cautious. When you’re ready to retire, you’ll most likely be living in a much more expensive world than we live in today due to inflation. Invest for the Long Term—The market will have ups and downs, but if you invest wisely and for the long term, you’ll have a better chance of reaching your long-term investment goals. Market Risk—An investment may drop in value due to a decline in the financial markets. Business Risk—An investment may drop in value due to a decline in a particular industry or company. Inflation Risk—An investment may not outpace the rate of inflation. Interest Rate Risk—An investment may fall in value if interest rates rise. International Risk—An international investment may drop in value due to political, economic or currency instability. Risk of Not Investing—The risk that you will not have enough retirement income to reach your retirement goals. Your Savings Target—Consider the amount of money you need to save and invest for a comfortable retirement. Your Time Horizon—Consider the amount of time you have to invest in your Plan before you retire. Your Risk Tolerance—Consider your comfort level with the ups and downs in the value of your investments. 1 Cash alternatives are not federally guaranteed and may lose value. 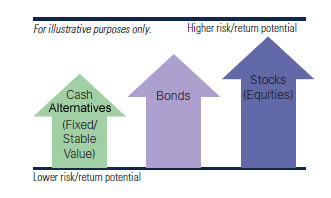 Cash-alternative portfolios have interest rate inflation and credit risks that are associated with the underlying assets owned by the portfolio. 2 A bond fund's yield, share price and total return change daily and are based on changes in interest rates, market conditions, economic and political news and the quality and maturity of its investments. In general, bond prices fall when interest rates rise and vice versa. 3 Asset allocation or diversification does not ensure a profit and does not protect against loss in declining markets. International Funds primarily invest in equity securities of companies based outside the United States, including companies based in Asia, Europe and emerging markets. International investments may be most appropriate for someone looking for greater potential returns and who is willing to accept a higher degree of risk. International investments may provide diversification for a domestic portfolio. Foreign investments involve special risks, including currency fluctuations and political developments. International securities may also be subject to somewhat higher taxation as well as less liquidity compared to domestic investments. Small-Cap Funds primarily invest in equity securities of public companies located in the United States that have market capitalizations of less than $2 billion. Market capitalization is a measure of a company's size and is calculated by multiplying the number of outstanding shares by the current market price. Small-cap investments may be most appropriate for someone with a longer investment horizon who is seeking long-term capital growth and is willing to accept larger market fluctuations. Equity securities of small companies may be more volatile than securities of larger, more established companies. Mid-Cap Funds primarily invest in equity securities of public companies located in the United States that have market capitalizations of less than $10 billion but greater than $2 billion. Market capitalization is a measure of a company's size and is calculated by multiplying the number of outstanding shares by the current market price. Mid-cap investments may be most appropriate for someone seeking higher potential returns over time who is willing to weather market downturns. Mid-cap stocks may be more volatile than large-cap stocks but may have the potential for higher returns. Large-Cap Funds primarily invest in equity securities of public companies located in the United States that have market capitalizations greater than $10 billion. Market capitalization is a measure of a company's size and is calculated by multiplying the number of outstanding shares by the current market price. Large-cap investments may be most appropriate for someone willing to accept market fluctuations in return for long-term capital growth. Stock investments tend to be more volatile than bond or money market investments. Balanced Funds use both stocks and bonds to moderate market fluctuations in the equity markets. Balanced investments may be most appropriate for someone seeking a balance between income from bond investments and capital growth from equity investments in one option. The investor is willing to accept higher risk for greater potential returns. Bond Funds primarily invest in debt securities of government agencies and private companies. They provide income based on the interest or yield of the underlying bonds. Changes in interest rates and the stability of the issuer can affect the value of the underlying bonds. Unlike money market and fixed funds, bond funds can result in a loss of principal. Bond investments may be most appropriate for someone seeking higher potential income than what might be achieved with a money market fund or stable value investment. The investor may desire to balance some of his/her more aggressive investments with one providing potentially steady income. Fixed Funds primarily invest in short-term to medium-term, high-quality debt securities. Each quarter a new rate is determined, effective for the remainder of the crediting period. These funds are also referred to as stable value funds because they strive to provide safety of principal and stable income. Stable value investments may be most appropriate for someone who wants to safeguard principal value or balance out a more aggressive portfolio. This investor may be nearing retirement and may require more stability and asset liquidity. Money Market Funds invest in short-term debt securities that earn interest and strive to maintain principal. Money market investments may be most appropriate for someone who wants to safeguard principal value or balance out a more aggressive portfolio. This investor may be nearing retirement, may require more stability and asset liquidity. You could lose money by investing in a money market fund. Although the fund seeks to preserve the value of your investment at $1 per share, it cannot guarantee it will do so. An investment in the fund is not insured or guaranteed by the Federal Deposit Insurance Corporation or any other government agency. The fund's sponsor has no legal obligation to provide financial support to the fund, and you should not expect that the sponsor will provide financial support to the fund at any time. Profile Funds, also known as asset allocation funds, invest in a mix of underlying funds across a variety of asset classes, providing immediate diversification.1 The funds are constructed by investing in a mix of international and domestic equity funds and bond funds, as well as fixed-income investments and cash alternatives. The allocation mix in these investments is based on an investor's risk level, ranging from aggressive to conservative. An aggressive profile fund, as an example, would have more equity investments and less bond and fixed-income investments than a conservative profile fund's mix. Investors choosing these options want to invest in a mixture of diverse investments suiting their level but do not have the time, desire or knowledge to select and manage their own portfolios. Passively managed funds, often called index funds, are designed to produce returns similar to those you would earn if you owned the securities in a particular market index. The funds are called passive because the way your money is invested is determined by the securities included in a particular market index and not at the discretion of a professional portfolio manager. Each fund has a stated investment objective included in its prospectus. You can elect to invest in a fund that is managed to mirror the S&P 500 Index by investing in the stocks comprising the S&P 500 Index. What type of investor should consider investing in a passively managed fund? This investment approach offers investors the opportunity to select an allocation of funds that follows different market indices. An investor may be comfortable with potentially lower returns than actively managed funds in exchange for generally lower fees due to less fund management. Each fund and the market index it follows has unique inherent risk. Actively managed investment choices are managed by a team of professionals that use research, financial analysis and personal knowledge to determine which securities to buy and sell. Each fund has a stated investment style and strategy included in its prospectus. Unlike passively managed funds, actively managed funds seek to outperform the market index. The potential to outperform the market is one advantage that actively managed funds have over index funds. There is no guarantee that a portfolio manager of an actively managed fund will accomplish the goal of producing higher returns than the fund's established benchmark. Depending on the underlying investments, returns may even be less than the benchmark index. Actively managed funds also tend to have higher expense ratios than index funds due to the expenses of the investment manager, staff and other resources used in deciding which securities to buy and sell. The investment style and strategy of actively managed funds can change over time, so regular review of a fund's prospectus by plan participants is encouraged. Investment style refers to the way a portfolio manager chooses and manages a portfolio of securities. While not a comprehensive list, the following includes the most common investment styles used for picking stocks. Growth–Managers utilizing this style invest in stocks that have potential to outperform the market over time. Growth stocks usually pay little or no dividends and typically have higher earnings growth potential; however, there is no assurance that the earnings growth potential will be realized over time. As a result, these stocks tend to be more volatile and, therefore, more risky. Value–Managers utilizing this style invest in stocks that are considered undervalued relative to criteria established by that portfolio manager, but which have potential to increase in value over time. Stocks in value portfolios often have higher dividend yields, which bring additional consistency to returns. Blend–Managers utilizing this style invest in a combination of both growth and value investment styles. These investment styles can be segmented further by market capitalization. A fund can also include specific investment strategies, including, but not limited to market sector, asset classification, asset allocation and geography. What type of investor should consider investing in actively managed funds? This investment approach allows investors the opportunity to select an allocation of funds that strives to outperform various benchmark indices with potentially greater return. There is a risk that a fund may not reach its stated objectives and performance goals. An investor must understand the risks and generally higher expenses associated with actively managed funds and accept them as part of his or her overall retirement strategy in pursuit of greater return potential. 1 S&P 500® Index is a registered trademark of Standard & Poor's Financial Services, LLC and has been licensed for use by Great-West Life & Annuity Insurance Company. The funds are not sponsored, endorsed, sold or promoted by Standard & Poor's, and Standard & Poor's makes no representation regarding the advisability of investing in the funds. A benchmark index is not actively managed, does not have a defined investment objective and does not incur fees or expenses. Therefore, performance of a fund will generally be less than its benchmark index. You cannot invest directly in a benchmark index.